THERE’S NOTHING “HO HUM” ABOUT THIS HOME! If your instinct is to spoil your children they will absolutely love you for buying this home. With five bedrooms the size of football fields (a little exaggeration never hurt), choice of living areas, fabulous swimming pool and separate outdoor pool house not to mention off street parking for up to seven cars – you will be “parents of the year”. Master suite upstairs with soaring ceilings, carpet, north and south facing windows allowing natural light and city glimpses. The property is close to the top of the hill on Kirwan Street which means it captures the cooling sea breezes in summer and remains warm in winter. The north facing backyard provides warm winter sun to all the main living areas, the upstairs rooms and undercover alfresco area. Established gardens and trees around back fenceline, very green and lush and also provides lots of additional privacy. 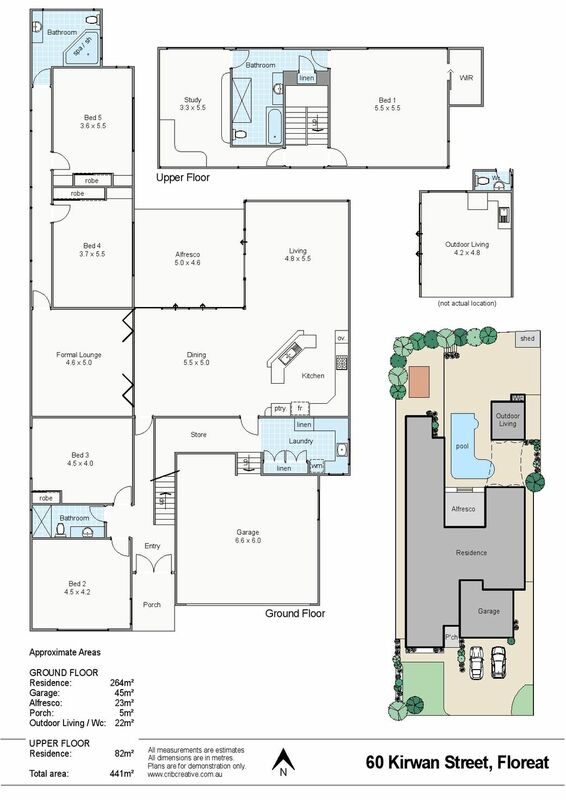 This beautiful architect designed property is located in a quiet Floreat street which offers easy access to the city via Cambridge Street or Underwood Avenue-Hay Street, the beach via Underwood Avenue, and Subiaco via Salvado Road or Underwood Avenue-Hay St.
Floreat Forum Shopping Centre is just 5 minutes away, providing easy access to shops, supermarkets and services. A little further will take you into the centre of vibrant Wembley, with plenty of cafés, restaurants and bars at your fingertips. Buses run close by on Cambridge, Alderbury and Brookdale Streets. Kirwan St Café is a 3 minute walk away and makes a great coffee. Lawler Park has great facilities for young families and is dog friendly. Perry Lakes and Bold Park offer expansive sporting grounds and picnic areas as well as the best views of the sea and city. Olympic sized pools are only minutes’ drive away at HBF Stadium, Bold Park Aquatic Centre and Claremont Pool. Other sporting facilities within close proximity include Matthews Netball Courts, Bendat Basketball Centre, Wembley Golf Complex and WA Athletics Stadium.